Missing a feature? Read through the posts below and if it's not here yet, add it as a short summary, <line-break>, the details if any. Alex, great work so far on the support forum. Search by Author, Topic or keyword. A feature or topic status indicator ie. Open, Closed etc. I know that some of these requests might be trivial, but (for me anyway) these features make it easier for me to use the support forum. Alex, is this feature still open and still on the back burner, or is it something that will not be able to be implemented? Bamit, the status of the Go/Stop request is that I am adding a "Start/Stop all backups" to the systray menu, but that's it. As I said before I think making Start apply to all jobs when none is selected is counter-intuitive and I suspect it will confuse more people than it will help. Forum suggestions - the timestamps I will be adding at some later on, bear with me a little while longer. Sorting is already supported, but it's in testing at the moment. With regards to the search - I will be looking at this as well shortly, but most likely I will just stick to the keyword search for starters. Thank you Alex for the fast response. You are always very attentive to your users concerns. This, in and of itself makes your software support better then the rest. a search feature on the forum would be useful! is there a manual for this program? Is there a way of getting it to email its status so that i dont have to physically check each machine is backing up? 1. I'd like to have an email alert if something fails. A tab where I can enter my SMTP server info so B2 can send the relevant log entries after a failure (or notify after a job finishes). 2. A mouse-over pop up on the check boxes with an explanation (or just a help button on the dialog boxes). For example, what is "concurrent backups"? I don't see any description or information about that option. 3. Throttling. When I do an initial copy, I don't always want it to use the maximum speed available, especially if it's over the network. 4. A scroll bar for when I expand all the "Change" buttons, because it runs off the screen. @Sputnik-ETO and @soylent - email alerts are scheduled for the next release, which is about 2-3 weeks out. This is one of the major outstanding features and I am actually looking forward to getting it done myself. 2. A mouse-over pop up on the check boxes with an explanation (or just a help button on the dialog boxes). For example, what is "concurrent backups"? Ok, will do, fair suggestion. "Concurrent backups" means that the app will run two or more backups simultaneously if needed. Otherwise, backups will be put into a single queue and executed one by one. Yep. This is already on a ToDo list as well, albeit on a lower priority. This I will not do. The dialog *is* very tall with all Change sections expanded, granted, but they are not meant to be all expanded simultaneously. I had a version where expanding a section automatically collapsed any already expanded section, but that came out somewhat clunky in actual use. I can make another pass over this, but I think adding a scrollbar is an altogether wrong direction. +1 for a search feature on the forums. An option for suppressing *system tray* warnings (the ones that are visible in the GUI log shouldn't be suppressible). 1. I create a backup from my local HDD to an external USB device. 2. I set the backup to run daily. 3. There are moments when I intentionally remove the device. If the device isn't connected at the moment when the backup is scheduled to run, I get a error warning that the backup didn't succeed and the tray icon flashes. If the warnings could be suppressed, and I'd have the "Run as soon as it becomes available" option on for missed backups, I could just insert the USB device and have bvckup2 do its job automatically without it flashing daily that there's a missed backup. At the same time, I'd have the comfort of the app making backups daily in case I lave the device connected for longer periods of time. PS: Love the app, keep the updates coming! That warning *is* suppressed if the "run as soon as it becomes available" option is selected. Though it's not really the warning that's suppressed, it's the check for a missed run, so there'll be nothing in the log either. This should still work for your purpose I think, shouldn't it? @Alex it should - I remember that I was using a build that was not functioning that way though. It may be that it was an older build. ...or that it was some other kind of error that caused the warnings. A feature i would really appreciate would be the ability to Export and Import your backup configurations. I for one would prefer to see a static program icon in the taskbar tray, rather than the flashing one when the program is backing up. This because as I have several different backups it's very often flashing and that is subtly disturbing. Dan, I've added an option for suppressing this animation. It will be in Release 71, should be out by the end of this week. PS. I have virtually all parts of the UI controlled from the config file, I can't believe I missed something as obvious as this. Alex, No worries. Missing little things like this is common in software development, especially if you are doing this all alone. It is probably easier to fly a helicopter blind folded then to create new software like this and run a website and support system all at the same time. I think you are doing great! Nick, can you give me an example of what you'd search for? Reason is, I would like to have regular backups on certain folders, but not at 3-5am since I have some unrelated maintenance scripts running. There are plenty of other use cases for this as well. Thanks and keep up the awesome work! Alex. Thanks for your reply. Just a simple keyword search box would be very useful, preferably with individual keywords and phrases. Forums become great organic knowledgebases, but if you don't know something is there, the information isn't useful. Personally I would prefer to see a more traditional forum interface with sections, categories and topics that can be browsed, with the ability to see new posts since your last visit. One long list of topics isn't intuitive. @eskay993 - Noted. I had this under "quiet periods" feature, but the cron-style scheduling is a very neat idea. Let me think about it. in settings.ini of respective backup (right-click on the backup, select Open Location / Config & Logging, exit the app, make the change to settings.ini and then start the app again). This will effectively abort every run between 3 and 5am, so the app will log an error to that effect. Do you not get this now? You should see either "new" or "+x" next to the topic entry in the index for new and updated topics respectively. I actually did that in the end with a pre-command batch script, although instead of setting to critical, I just had it run the disable job command during the period and enable job all other times. Works really well, and I think has the added advantage of not sending a critical fail email (which I assume exit 0 would). @alex Sorry, yes, I've found that now! I miss a file file version feature. So i can backup file changes for x days, like the already existing file delete / keep x days feature. Last feature suggestion: run Backup only if the home network is available. Re #29 - this is exactly how it works at the moment. You should see a backup sit in "Waiting for a network location..." state when the network is down or if a remote share is not available... hmm... though if the network comes up and then comes down, a backup will not re-enter this state until it is run again. Re #28 - yep, good idea. #30 Okay thanks for answer Alex. I will follow up topic 158. That would be a killer feature. On Linux machines i solved this with rsnapshot or rdiff backup. I want to keep some file history for user mistakes. Would be very helpful if you could have 'Forgot your Password' if that happens. Thank you. Ok, will be adding the "Reset your password" option shortly. If you have time it would be awesome to see your patterns working in real time in window where you select files/folders to include (Under "Then include the following items). Something like small icon next to folder/file showing if it is included/excluded by filter. +1 for Hooch's idea as well. I spend a good amount of time reading my Inclusion/Exclusion and imagining what will be copied and what will not due to the complexity of certain backups that I had. This would be a major help. Must start with a compliment on the incredible speed in new version 72! Bvckedup in just over 39 mins!! Really excellent!! My suggestion came from this run, in which I got 131 errors. These seem to be all files that don't appear to be there! However, there doesn't seem to be a way to see which error (in numerical terms) relates to which actual 'error' (as in 'details') in the log. Could the error indication have the error "numbered" rather than just saying 'error'? I know I can jump from error to error using the red arrows, but would be great to put in a number so as to go to that error detail directly. Bvckedup in just over 39 mins!! :)) Can I ask what's your setup is like and how long was it taking in the earlier version? With regards to 131 errors - this is most likely due to some files disappearing between the moment bvckup scans the source location and the point where it actually gets around to backing these file up. A proper fix for this is to set "shadow copying" to "require" (in More Options section of the backup config) and switch the app to run as administrator (in the Preferences). However, this applies only if you are backing up from a _local_ drive, and not from a remote share. With regards to the numbering of the errors - sorry, you lost me completely. Can you elaborate on what you want to be able to do and what should be happening in response? Any news on when you will add the "monthly backup" option? It's on a relatively low priority, but I will try and get it in the next release or two. I bumped it up on the ToDo list. With a lot of different backups to different devices, it would be nice if we could group backups with a group icon and/or allow the group name text to be a different color if no icon. You have done so well making this easy to use, this is low priority stuff. It seems that allowing colored text in the backup name might not take long though. Thanks. Noted. There is already a request for collapsible grouping, I'll just +1 it. It would be really nice to have file versioning, in case something becomes overwritten. Also to be able to choos how many file versions one would want. You can already do that, using Samba on the Linux end. This is how the vast majority of NAS and storage devices integrate with Windows these days. Following up on the older post I've made in this thread. I've created another daily backup from an external drive to my local HDD, and I definitely still get a warning that there's an error in the job condition (because the scheduled backup didn't run) when I don't have the drive plugged in, even though I have the "Run as soon as it becomes possible" option turned on. An option to suppress the warnings if the source/destination device is missing would be great. Even one that would disable warnings for the whole backup profile would be helpful. and thanks for a splendid application. Took only a few hours to decide on buying/settling with it. @Gnorf - with an exception of "# of tasks" all information is readily available if you hook-up a post-backup command. There are over 60 environment variables set up that capture both the config and the state of the backup. And thanks for the "splendid", glad to hear that! Alex, thanks for the info. Just started to dive into the documentation. Using the switch caused a prompt to open but I did not manage to get any file export. Been a "trillion years " since i used commands. The mail send function worked great however and resolves the reporting desire. But actually might be a better idea in a corporate context, one where I do believe your application could simplify things greatly. And yes it was intuitive enough once one dug into it. If I only could get the file export to work.. hehe. Any way to simply select multiple drives as a source and back them up to a single destination in one shot? At the risk of being redundant, I noticed the post about date stamp above. I'm unclear as to what would be data stamped. So I suggest a simple feature of optional date stamping a backup destination folder. So for example a once a week backup would result in 52 date stamped folders over a year. Also being able to set it up so a real time backup can change to a new folder at regular intervals. I recently had a situation were a data base got corrupted, but could be still copied. so the backup contains the bad file as well. simple date stamping of the destination folder would have been helpful. With the new update & feature of copying speed and completion time estimation for large files with is superb, would it be possible to have this feature available for the overall backup/complete backup. Maybe an option to enable/disable this function depending on user preference. As at the moment I am testing a 1TB backup and have no idea how long it will take other than to check the steps/wait for the backup alert etc. Would it be possible to have the label that shows how many changes - linkable/hyperlinked e.g. To be able to click on 32 changes & it show's all the files (full path which are also clickable or right click open file location) that have been changed. This can be shown either on the log UI window by clearing the log file or using another UI window. This just make's it easier to see what changes have been made & ready accessible on your fingertips rather then go through/scroll through the files. Excellent software, simple, powerful and quite elegant. May I suggest a report that lists all backup jobs, their backup settings and statistics (size, number of files). I'm feeling cheeky to already suggest new features without first echoing the sentiments of many about how nice this software already is! Computers and software are such soulless commodities, and come and go, but sometimes you come across a product that almost has soul because it is so clearly created with care and diligence, and supported promptly, efficiently and with consideration and humour... that is, with such pleasant humanity. And the product simply works, and works so well because of all the above along with a fantastic dose of technical proficiency! I must say that I do like the hyperlinking suggestion above. I also wonder if it might be possible... (oh dear, how long is that to-do list already? I am so looking forward to versioning!)... 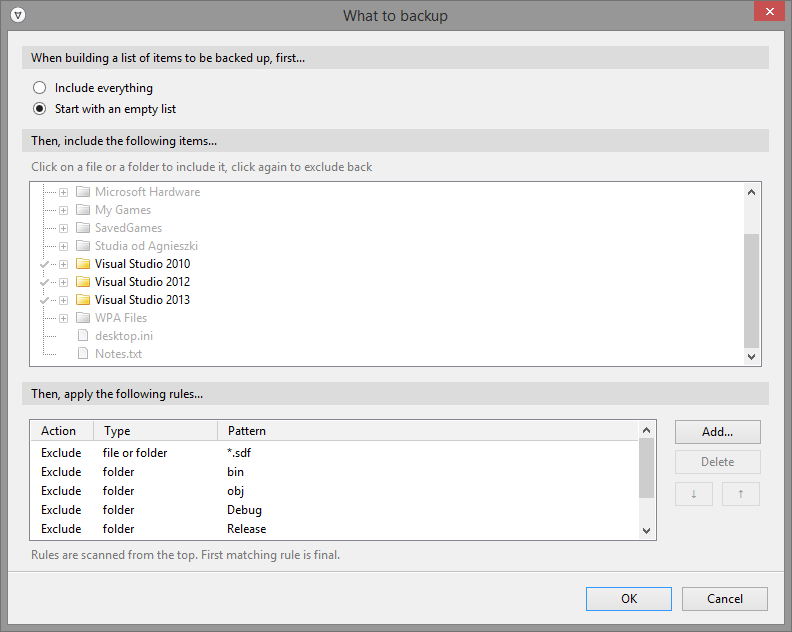 to introduce some kind of "de-cluttering" for the list of configured backups. It doesn't take long to find many useful configs to apply, quickly becoming a long list of mixed items of varying significance and frequency, etc. An ability to sort and/or nest items, perhaps using user-definable labels and/or alpha, frequency, size, doc/media types (or any other meaningful categorisation, with auto-colour-coding of course :) ) would be very useful here. Anyway, enough waffle from me... thanks for the great product! Alex, Sorry for jumping on this. If I am wrong please let me know. renechavez, You could use the "shudown.exe" command in a batch or script. Here too is an example of running commands during the backup process. I have a backup to a network drive which is scheduled to run every few hours. Often I am not on the network and the drive is unavailable. 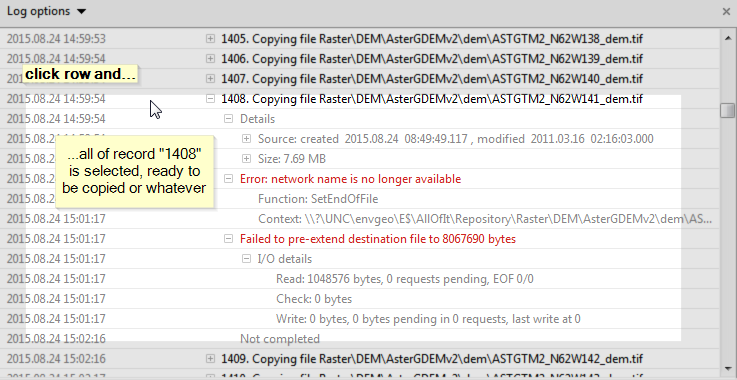 I get the error saying it has failed, which is okay, but rather than it telling me e.g. "Missed scheduled run 6 minutes ago" it would be much more useful to know e.g. "Last successful backup was 15 hours ago" as then I would know how much data was at risk. It would be awesome if bvckup could send data to another bvckup instance over a p2p connection. (Given your history with Hamachi I thought it wouldn't be too far fetched to suggest this). I have a few use cases for this. I'd like to be able to backup the computers of a few of my family members (who live far away) to my local system. The setup and operation on their computers needs to be very easy. The other application would be for a business that has several employees that work remotely all or most of the time. Their laptops should all be backed up to a server running in the main office. I realize this could already be done by using a VPN client + Bvckup + some scripts but my experience with SMB over VPN connections has been less than great. Having some kind of remote management and logging on the server in the office would be really nice. I realize this would make the program way more complex because you'd have to implement your own transport protocol and not rely on SMB. If someone can suggest some other program that already does something like this that would be great. I am aware that you can do something like this with the Crashplan personal backup version but I really don't want to have to subscribe to a cloud storage backup service when I don't actually want to use their cloud storage. I really also don't like their resource heavy Java client. One thing I would like is to either group jobs, or be able to copy > 1 folder per backup. I have several folders in the root of my drive that don't get moved around/changed much (Music, Photos, etc.). It would be nice to be able to select all of them at once and have one job do them all. So selecting D:\Music and D:\Photos as the source and E:\Backups\LongTerm\ as the target would just create the folders; E:\Backups\LongTerm\Music ,... and back them up appropriately. Are there any plans for encryption of the backups? For the multi-folder backup you can already do that. You just need to select D:\ as the source location and then use "Backup What" filters to include folders that you need (that is, use the "Start with an empty list" option at the top and then pick what you need in the list below it). Re: encrypted backups - no plans for adding backup encryption to the app, but it doesn't mean that the app cannot be used to make encrypted backups (see below). 1. Encrypted files will require decryption upon restoring, meaning that the app will need to get a "restore" function and this is something that I don't want it to be adding for the sake of keeping things simple for those who don't need the encryption. 2. If encrypted files are stored in a proprietary format, it automatically means a vendor lock-in. This happens to be the case with virtually all backup software with few notable exceptions like tarsnap and arqbackup. So, if there _is_ an encryption, it needs to come with a complete description of the storage format and, ideally, bundled with open source tools to extract the originals given the encryption keys. 3. Cryptography design is hard. It also ages quickly and prone to spontaneous discovery of implementation flaws and algorithmic weaknesses. These will then need to be mitigated in an emergency fashion, plugging the leaks, re-encrypting the data, etc. I worked on VPN systems in the past, so I have some experience dealing with crypto matters and the rule of thumb is to try and keep everything crypto as divorced from the rest as possible. To that end, the simplest option for having encrypted backups is to direct them onto encrypted storage, e.g. True/VeraCrypt volumes or Bitlocker'd drives. Another option is to keep data encrypted *at source* and then back up the underlying crypto container, e.g. you'd create a TrueCrypt volume that sits in a TC file, mount it as a drive, store all your data there and then use shadow copying to back up this TC file as required. 2) Ability to backup applications own settings from AppData directory: I currently backup my settings for various applications & games from the AppData directory. Would be nice to have bvckup2 able to backup its own files so I don't have to manually copy over before I re-image my machine. 3) Easier to read log panel with filter option for only errors. ckasprzak, if you "expose" the folder(s) you're interested in (Show Hidden Files) before you set up the backup, set it up, then hide your hidden files, it should work just fine. I've been using it for quite a while that way. ...in fact, on my system, Bvckup2 sees the hidden folders even if I don't have them set to expose. It might be a General User vs Administrator thing. I don't think there is a way to auto-run a backup ASAP if it missed it's deadline. I have my main storage backing up on a 6 hour cycle and every time I switch the PC on in the morning, there is a, (slightly irritating due to it being unnecessary,) flashing icon in my notifications telling me that I missed a backup, when it could just run it. Bah. Of course, there is! That's perfect, can't believe I missed/forgot about it! In that case, maybe, a "Hint: Did you know you can..." should pop up (as a small bar within the application) if a backup is missed while the PC was off. My logic in turning it off, was that the files would not be edited while the system was off, so there was no point in running it ASAP. And then I completely forgot about the option, and was trying to find it in "Preferences". I know its only cosmetic but I'd like to propose a feature to group backup jobs and collapse/expand them. When there are excluded directories in certain jobs, you end up creating multiple jobs which are basically related and they clutter the list. "I also wish we could run multiple versions in our other personal computers with a single license. :)"
I also think this would be much nicer. If someone wants this for all the PCs in their house. Lets say, 2 desktops and 3 laptops, it starts to get really expensive. Totally understand why it is how it is though. Maybe a ~$2 per system per month subscription may be a nice addition for the future. Any chance of optionally displaying the log file contents just for the latest/current backup run (on a per-backup-task basis)? I'm not talking about how big log files should ultimately get (that's already been discussed elsewhere). I'm talking about how much of the log file should be shown. There's a clear separation possible (and desirable) between the results for the latest backup run, and all historical runs. I'm thinking in terms of a "display latest / display all" kind of GUI button, to allow viewing the latest log file for the currently-selected backup task. That would make it much easier to quickly scan the latest backup results to check for error details. @Logician, @Ghost - I can't believe I haven't replied to your comments, sorry. Re: grouping - yes, will do, absolutely. It's been sitting on the ToDo list for a long time now and I think it's finally ripe for implementation. Re: subscription licensing - noted, let me think about it. @mtc - that's a very nice idea, thanks. I'll try and get it done in the next release. fortunately I put the backup at ZFS which one two weeks snapshot so I can rollback backup. I also think like @AndCycle it should be warning if lots of files need to be deleted. I know you are planning to implement some kind of versions control. But till that i think simple and useful option can be implemented. Now all deleted files moved to backup folder. I think it will be more informative and useful if for each day when deleted file was detected subfolder inside backup folder will be created with date as name of this subfolder, and deleted files will be moved to this subfolder. So user can know when files was deleted and clean old files. @AndCycle - Did you have the archiving disabled? That's what it is for - a safety net (or a staging area if you will) for deleted files. The thing is that when the app runs a backup job, it is *not* an interactive process. This is due to the fact that the engine is a self-contained module that is designed to operate in the absence of the UI. It *is* of course possible to make the engine pause the job under certain circumstances and then rely on the UI to either resume or abort it, but I think this will make the app's behavior less predictable and consistent. For one, UI warnings may go on unnoticed, causing the jobs to stay paused much longer than they should be. For two, the behavior of the app now becomes different depending on whether the UI is attached to the engine or not... I mean, throwing a warning in a mix seems like a simple thing to do, but once all edge cases are considered it may end making more harm than good. I think it will be more informative and useful if for each day when deleted file was detected subfolder inside backup folder will be created with date as name of this subfolder, and deleted files will be moved to this subfolder. Let me think about it. This is not a bad idea, thanks. maybe a threshold setting to send out warning mail will workout? We really need to know when the last SUCCESSFUL run was. Right now the only way to know that is by changing log options to show full log and then scrolling through the days if not weeks of failed jobs. I just purchased personal version and it is excellent for home use. It copies and most off all syncs FAST. It works so good that I would like to suggest this to company that i work for as well, but that would require central management to be possible. Backup softwares that I have seen with central management, are slow, lack parital copying and constant, live backup. I'm a long-time user of Bvckup and absolutely love it. A feature that would be useful for those like me who can't remember why they did something from one minute to the next would be a notes facility for each back-up job, perhaps added to the right-click context menu for each job. In the notes section, I could summarise the reason for the existence of the job and explain exactly why I need to back-up such and such to so and so. I can imagine that it would also be useful for those who work in teams. Forum request: +1 for search please. B2 request: It would be really handy to be able to select and copy individual entries from the log panel. This has been on the list for a while now, will do shortly. Thank you for making such an elegant backup program. I have noticed (on version 74.20) that setting a 12 month interval starting at 1 December 2015 (3am) results in the error:- "Selected combination of first backup date and the monthly interval results in one of the backups falling onto (null) 1, 2016 which is a non-existent date. Please correct." Is this a bug? Please can you fix the above if it is a bug, or maybe add a "yearly" "Backup Interval" option. Oh, that's a bug. Whoops, thanks. I'll have it fixed in the next release. When backing up there is a progress bar for the overall job, which is a thin bar. When the backup is processing a large file, there is a thicker larger progress bar displayed in addition (see http://prntscr.com/8u5oqi for example). My request is to swap the two progress bars. When looking from far away at a large backup job, the first thing we see is the large bar, which is NOT the progress of the overall backup job. It's good information to have what percentage of a large file we have completed, but the most important thing to know is what percentage of the entire backup job is complete. It's confusing to have to look at the (much) smaller progress bar to get that answer. Even though I know how it works now, I always confuse the progress of the current file vs what I really want to know, which is the progress of the complete job. I am making primary backups on days of the week with software from other sources (ie Windows Backup and WD's SmartWare). I want to use Bvckup to create a redundant copy of the Mon/Wed/Fri backup - so, on Tues,Thurs, Sat. A workaround is to make the redundant copy once every 7 days, but please consider adding this feature for compatibility as others may be doing the same. There's already option to space backups N weeks apart. Setting N to 1 and selecting starting date to fall on required day of the week should do it, no? Noted, thanks. I will have a look. Can we change the default log viewer to replace notepad? Like notepad++ ? Would be great if we could configure this (even in a config file somewhere)? If you are to add either of these, make sure to exit the app first, because otherwise your changes will be ignored and overwritten. It would come in handy if a backup task could be placed on the desktop (with an icon) and started by double-clicking. I bought Bvckup 2 about a week ago and it's really awesome! Another awesome feature would be (though I guess this would be a somewhat bigger project) if it was possible to sync into a zip, tar, or other archive file similar to what some other backup programs do, i.e. there are directories on one end and a (possibly encrypted) archive file on the other end which gets updated if there are changes. Hi JohnO, sorry I missed your comment. With regards to backing up into a compressed container file - technically it's not hard to do, but practically there are no plans to support this, at least not as a part of _Bvckup_ product. The primary reason is that this will simply blur the focus of the app, making it a less exact fit (and therefore less appealing) for both basic mirroring setups *and* for the cases you describe. If you are after compression, a better option is to enable NTFS compression for the backup folder (or even the whole drive). If you are after encryption, then you can either back up onto an encrypted drive (using TrueCrypt or BitLocker) or encrypt data at source and back up the underlying crypto container. a) could implement 'versioning', the ability to store different versions of a single file in a dedicated folder inside the destination. This is very useful for logs that keep changing over time and must be kept for future history. b) 2-way sync (I've read your comments on this but I guess we cannot stress this enough, this is really useful). Timmyx, there is a basic support for versioning already and a proper implementation is essentially what Bvckup 3 will be about. With regards to the two-way sync - there are no plans for this at the moment. There is a chance we'll get around to supporting it, but it will not be a part of *Bvckup*, but rather as a separate app (Svnc?). This has to do with not letting the focus of the app wander and blur. Once the app starts to do more than one principal thing, it starts to lose its appeal for all cases that it covers. It also starts to bloat. Neither is something that I'm OK with. Hi, I'm currently trialling Bvckup2 and so far it is brilliant. I don't seem to be able to find an option to force a backup to run on shutdown. Is this something that could be added? Bvckup2 is great for copying files and making backups. Does it also provide a simple way to restore a backup completely? Simply speaking, run a backup with the “Backup from” and “Backup to” folders reversed? I have looked in the main menu, right-clicked on a backup, but found nothing appropriate. Did I miss something? No, you didn't miss anything. Restoring files is indeed a simple matter of one-time copying them in reverse direction. As it's a inherently trivial function that has plenty of native Windows analogs (from Windows Explorer to copy/xcopy/robocopy) it is not included in the app. Do you think it should be a part of the app? Hi Alex, just downloaded the trial of Bvckup2 and ran into an issue - I only need to back up selected folders without making extra copies of system and temporary files. Start with an empty list seems to be working good for folders selection, but all the beautiful rules for excluding 'extra' files disappear when Start with an empty list is chosen. Am I missing something? Or may be you are planning to add .tmp-like filters for Start... in the next version? Once you start with your blank list and add your folders, just use the ADD rule feature and add in the exceptions you want. Yes, I see that option. What I'm asking is the ready-made set of rules excluding temporary and system files. Which are common and as far as I see are already included into "Include everything" setup. I was wondering if it would be possible to rethink the archive naming structure. It would be easier to restore previous versions if the file name did not change. Instead of renaming the files with a timestamp it would be easier if the files were recreated in a folder with folder after the timestamp. If you then would need to restore a whole directory one could jut copy the files instead of having to go through renaming each file. @Hjalmberi - OK, noted. Will do in some form in the next release. @vwillems - Good point, thanks. Originally, the archive was meant to be a safety net for very rare screw-ups, so the easy of restoring from it was not exactly at the top of the list. I'll see what I can do about this. Alex, Been using Bvckup2 for a couple of weeks now and love it. One issue I'm having is debugging errors. It would be great if there was an easy way to filter the logs for JUST the errors so I could easily find and debug them. Perhaps a switch to show only errors? Thanks for a truly great piece of software! I would like to backup to AWS, Google or Azure ? With the speed of Bvckup2. But Im missing a FEATURE of copying source files to MULTIPLE LOCATIONS at once, which basically means I want to copy directory from disk F to disks H and N simultaneously. Thanks in advance for looking into it. A feature that would be really useful for us is the ability to trigger an email if the backup completes with no changes detected. Since we are constantly doing backups, no changes means something's gone wrong with the source files, so it would be a very useful alert to receive. But you will also NOT be getting an alert if something happens to the app itself, meaning that the lack of the alert will mean both a critical condition and the lack of thereof. Have you considered enabled alerts on completion of every run, adding $STATS_FILES variable to it and then doing the server-side filtering based on its value? Would rock to be able to create a new backup using an existing one as a template (or to be able to set my own global defaults for new bakups). I almost always use the same settings, but it requires a lot of clicking to get each backup set up. It could do both those at full speed, but instead it does them sequentially unless I go in and force it to start the second one. Maybe I'm missing it, but an estimated time and MB/s readout would be very useful. I'm always just kinda nervous when I can't see those. Ok, that's it for now. I *LOVE* bvckup, btw... super great. Keep it up! At the moment it's either "all jobs in parallel" or "all jobs in one queue" (controlled by the "concurrent jobs" setting from Preferences), but shortly we'll be adding support for multiple job queues. Each queue executes its jobs sequentially, but queues themselves are serviced in parallel. ETA is coming up shortly. Stay tuned. At the moment it's either "all jobs in parallel" or "all jobs in one queue"
This one has probably been covered before, but man it still trips me up every time, so I just gotta get it out there and you can tell me why I'm crazy. I go to double-click a task to run it, and it pops up the options instead. I'm just so used to 'double-click = execute/right click for settings' in windows (and you do have the right-click part). I know I know, another request for a 'settings option' in a system you're working hard to keep clean, but it really would be nice to have an option for left-click to run the clicked backup. A 'Run All' button would be super helpful too. Someday it would be totally awesome for you to do an app to replace the windows file copy. Your copy stuff is so fast and nice, it would be sweet to use it instead of the clunky windows ones, and the buggy, crashy (and not super pretty) Teracopy. AaronP said - A 'Run All' button would be super helpful too. Aaron, A Run All type of button would be nice, but for now, there are two easy ways to achieve this. You can also Ctrl-click on the empty space to right from the toolbar buttons. This acts like Ctrl-A. Then click Go. Re: double-click - let me see what I can do. Thinking about archiving (I have searched for this but I hope I'm not duplicating) - is it possible to apply filters to what gets archived? In a realtime backup I have there are a lot of transient files - they have the same name, but are deleted and recreated every few minutes. They do need to be backup up though as they contain critical data. So my question is - can we apply file and folder filters to the archiving part of Bvckup 2? The outcome would be those files would always be up to date in the backup, but not placed in the archive. @Bamit - Adrian is asking if it's possible to have some files deleted and some files archived based on a separate set of filters. I've created cleanup scripts to remove the transients from the archive on a cron job. I have a question about symlink folder (and files). I have a source code folder that contains a few hundred git repos, and thousands of libraries and reference documents that span over many years of an ongoing project. To organize the information within, and reduce duplication, there is liberal use of symlinked folders. All symlink folder targets are within the backup source - therefore they are relative to the target. I don't want a backup to traverse folders. In my case this would create an unreasonable amount of duplicated data. But I also don't want the symlink folders (and a few files) ignored. So here's the request - might it be possible to detect the case that a symlink folder (or file) is relative to the target and is within the source, that the symlink be re-created with the relative path at the destination? I understand that symlinks may have either static or relative paths - the recreated link would best have a fully relative path. There is shell extension - "LinkShellExtension" that embodies this very idea to a much further degree. It has a function "Drop Here: Smart Copy/Mirror"
The description for which: "Smart Copy creates a copy of the directory structure from the source location to the destination, but it preserves the inner hardlink structure and inner junction/symbolic link relations of the source, and recreates this inner hardlink structure and inner junction/symbolic link relation at the destination location"
I found your discussion here: http://bvckup2.com/news/02-11-2012 and it seems the outcome from that survey was to ignore or traverse. I wish I'd been a (voting) user back then. I hear you, but at the end of the day symlinks is still an alien feature on Windows, primarily used by Unix transplants. Just look at how "mklink" needs full admin privileges - it's clearly a bit of an afterthought for NTFS rather than a first-class feature. You are literally the first person I am aware of who is consciously using symlinks on Windows. I understand *why* you do that, I'm just saying that it is exceptionally rare. Now weigh it against the development cost and all the extra code that will end up getting into the backup engine and the ignore/traverse decision will probably make more sense. Understood. When I have time I'll create a powershell script or something to perform this bit. Thanks for the explanation! Sorry I haven't read through all the suggestions above but I would like to make a feature request (that is most likely a new program request in reality). The ability to clone a windows installation. Fantastic piece of software Alex. I have my backup NAS drive switched off on the weekends. If my computers are turned on, it's for non work use. Would it be possible to have switches in the settings to set bvckup to only run on the designated days, i.e. Monday-Friday? That way it would not be alerting me to the fail condition on the other days. I agree with -TeGorilaGuide- I have similar problem. From MO to FRI is normal daily backup (all servers on Archive1). The Bvckup2 is really fast and I get some free time over the night, but I still need Saturday and Sunday in other regime. A proper way to support this is, I think, through a notion of "quiet times". That is, to allow setting periods when backup runs are suppressed. It can be the weekdays, it can be the night hours, etc. And it shouldn't be limited to scheduled backups, but also cover real-time ones. This should work for your purpose, correct? THX for quick response. I’m searching but I can’t find –quiet times- switches or settings in applications. I see there is a MB/s readout now when a large file is being copied (if you are fast enough click on the message and switch the mode to it). It would be very useful to have an average MB/s readout for the whole copy job (or a sliding window), too. Like next to the "Step X of Y" text or something. That info is critical for tracking whether copy speed is going as it should. I'm pushing like 19TB of data from external drives to my nas with bvckup right now, so... speed feedback is really important. Would love the ability to use your app for backup to Amazon Cloud Drive. @Elliot other than data duplication, can't you already do that? I backup to a local drive which happens to be my Dropbox folder. Dropbox then uploads the new data to the cloud. Drives are so cheap these days, you could have a workaround sooner than having the author consider it as a feature. any grouping backup's together? i have a site where i have round 20 backups running and would like to group them by type with maybe a dropdowns where i have a list of backups by type and then a dropdown that shows the backups for that type. I'd like to see a change to the email parameters. I'd like to send an email on completion with any error or without an error and at least one file changed. I'd like to skip sending an email if there have been no changes and the process completes successfully. I am a home user and software is at its best when it is not noticeable and doing its job without fuss in the background, so I am pleased to have discovered and using this app for over a few months! I have a request to make, I would like an option to manually or maybe also to set timed intervals, a full scan of the state of the backup compared to the original so that I have some extra confidence that nothing has been corrupted over time. Maybe this could also incorporate a media scan but not sure if that it a bit out of scope. I use Delta Copying and Destination Snapshot to minimise the application resouce and time so to be able to verify my backup periodically, say twice a year or before I am about to use my backup for a PC or HDD migration would be very useful. Would be happy to pay extra for such an "add-on". I would like an option to manually or maybe also to set timed intervals, a full scan of the state of the backup compared to the original so that I have some extra confidence that nothing has been corrupted over time. Absolutely! This will be making its way into the app shortly. The media scan *is* a bit out of scope of the app indeed, but we'll see. I'm testing Bvckup 2 in the trial period (mostly as service), and I have some ideas to share with you. command. Maybe you can implement this simple functionality as an option in the bvckup interface? 2. To get a smaller number of backup jobs, as a source, I use collective folder which have symlinks to different locations which should be backed up. Maybe you can add an option how far symlinks shoud be followed, to the "Symlinks and junctions -> Follow for directories"? In my case I want to follow symlinks from collective folder, but do not follow symlinks on the real source locations. 3. A part of above symlinks pointing on the network location. But I can't give credential to the resources, because bvckup think, that the source and the target are all on the local drives. I use pre-backup script with net use command to pre-authenticate network location, so I have a workaround, but maybe you can implement similar functionality? 4. As we know, on Windows, network share can be authenticate only on single credential on time. Because of the security reasons and limitations of my NAS, I need to use more than one account, for more granular permission. I have workaround for that. You can login to single network storage on diferrent account, using IP address with first credential and network name with the second credential. Probaby will be possible using even more account names at the same time if you create aliases in the C:\Windows\System32\drivers\etc\hosts file. Maybe it will be useful for someone. 5. To avoid unecessary file changes on the destination, I'm revoking writing rights for all account, except bvckup service account. Other users, even administrators, can only read. I believe that give me greater security against threads like cryptolocker and human errors, that defaults permissions. Maybe you can add an option like "secure destination permission" or something similar, which automatic define secure ACL on target drive? 6. I will be delighted, if you implement backup jobs groups and inheritance. For example, I have three backups plan which differ only the destination, interval and start time and the pre-backup scripts. If I need change something, I need to do it on every plan, which is error prone and difficult to maintenance in consistent state. If I will have an ingeritance option, I would make a change in one place only. Remote Desktop Connection Manager do great work with that, you can look on it. Finally: great work! Increadibly low resource consumption and very high speed. Keep it up! A hopefully simple suggestion, in the Archiving details dialog there is a dropdown which lets you choose minutes, hours, days or weeks for the delete after value. I would like to keep a backup of anything deleted for a while before it is removed, so a 'months' option would be helpful rather than just having to work out and enter a high number of weeks. Is there any chance Bvckup 2 will be made available for Linux any time soon? The chance of that is vanishingly small, sorry. Creating and distributing commercial desktop software for Linux is very tricky to put it mildly. It would be nice the STOP button to say PAUSE instead . I just found out by mistake this ability of it ! Hi. I did a quick search but didn't see anything obvious. One feature I would like to see (or be told about if it exists!) is to mount and dismount a semi-permanently connected external HDD. Mount it to backup, backup, dismount. The theory is tolerance against virus spread. I would, say, set it to run weekly so the window of "live HDD" is small and it remains unreachable. Alternatively, have a backup trigger that works on connecting the external HDD, with an option to dismount it when it is done. This can then be unplugged and stored off-site, and a new one or counterpart plugged in, triggering the next backup. Regarding the outbreak of Crypto-Malware, backing up to accessible NAS folder has become inadeguate (if my account can access the share, the malware can encrypt the shares too). In this regard, backup software that uses a client and does not use Windows Shares is not exposed to this risk (think of CrashPlan as an example). Could client solution be implemented in order to avoid having direct shares access to backup? Mount it to backup, backup, dismount. This is a good feature to have, not terribly complicated to do either. have a backup trigger that works on connecting the external HDD, with an option to dismount it when it is done. This is readily supported with combination of device tracking , "run ASAP" setting  and media/device ejection . Just make sure to use "by volume label" tracking option, name all backup drives in rotation the same way and set "Detecting changes" to "Re-scan" in job's settings. I've been mulling this client-server (or, rather, p2p) model for a while now, but mostly for performance reasons. When the copying is done with two cooperating processes, there is a LOT of optimizations that can be done. You are of course correct that it would also make it possible to prevent direct file system access to the remote share if needs be. This will need to be complimented by a proper versioning mechanism, so that if the source gets corrupted/encrypted/etc. and this corruptions gets relayed to the backup, you'd have an option of going back to an earlier pristine version. I don't however have an ETA for this at the moment. Thanks for creating the awesome software we have been using on our pc's for quite a while now. We're sorry to ask again like many before us, but are you guys planning on creating this amazing software for macOS since we're using both platforms in our film and photography studio. No current plans for supporting macOS, sorry, Dennis. It's a complicated can of worms on the marketing and sales side + the overall market size is about 10 times less than that of Windows. Any thoughts on having being able to connect to remote machines for remote administration of the backups. As in perhaps being able to setup a new backup/time from a remote machine from a central machine (providing there is connectivity between the two). It would be nice to be able to administer multiple machines from a single location without having to bounce from machine to machine. I know this would be a fairly large feature/component to implement - does anyone else have a want to need for something like this? Greg, you hit the nail on the head here. Some form of a dashboard for central managing of larger installation is a natural next step in extending what we already have. We did a prototype of a hosted version of this earlier this years - a console that was to be hosted by us and that allowed "pairing" installations with a console (management) account. This got moth-balled for the time being, primarily because this required setting us up as a 24/7 service provider and that something that we are not quite ready yet for. The interim plan is to produce a standalone dashboard in a form of a regular installable Windows program. This also should allow for several interesting features like LAN discovery and simplified site-licensing. There's no ETA, but this is fairly close to the top of the ToDo list. Glad that is an idea that is liked and being considered. LAN discovery paired with a remote installation (with appropriate rights of course) could also be quite a very cool feature for ease of deployment. I love the idea of a simplified site-licensing. 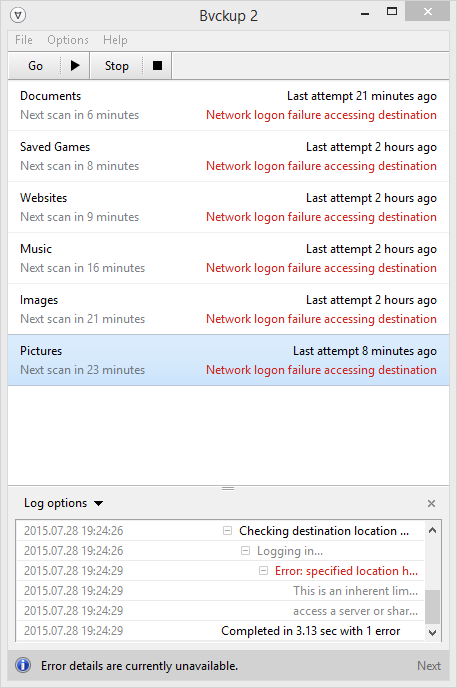 Also having a central dashboard for checking backup status and backup notifications or errors, etc. I could see the hosted version of a dashboard being nice, but I could see some companies having some issues with connections to an outside source or having that connection from the outside needing to be opened up for administrative purposes - that will of course vary company to company according to their security policies. Understandable on the no ETA, but nice to see on the upper levels of the ToDo list. I love all the polish that goes into Bvckup2. The only suggestion I can make is to have the version number on the About page link to the changelog. After an upgrade I like to see what changed and that's just where i'd go. Thank you for the great program. I really love your software, thank you! I have a feature request to stop or make warning before huge backup jobs at "metered wifi network" connections (win10 feature) especially when delta state is dropped. My scenario: I have a backup job for my outlook archive.pst 6GB to my company’s shared drive. It works brilliant with delta copy. But today bvckup dropped the delta state (I know it could happen regularly or in some circumstances) and started to copy whole 6GB file over mobile wifi connection when I was connected to my company over VPN, so the shared drive was accessible. That would great to have an option to turn off/make warning when delta is dropped. At least when "metered connection" is set in win10. I know this is not a common issue or not a problem to copy the whole file while you are on LAN, but can cause issues over limited mobile connection. Or in general a turn off/warning when you are in “metered connection” and the backup job is greater than 100MB, 500MB, 1GB, whatever. @streng - I think the right thing to do would be to have an option of not running the backup if on metered connection. That is, just an On/Off, without any sort of size/delta conditions. Yes, sure thing. Could be easy to implement and can solve my issue. I still can run (set/ON) the jobs manually if needed. Thank you for your reply. It would be great if we could copy data to/from SFTP servers ! There are some solutions on the market, but none is reliable or able working as a service. Thierry, I understand the reasoning behind your request, but the chances of SFTP being added to Bvckup 2 are zero. This is just something that falls well outside of the program's domain, which is file-system-level replication. Could a button be added to refresh available destination devices? One of my external HDDs has BitLocker enabled, and when Bvckup is started before the drive is unlocked, Bvckup will keep its task related to this external HDD at 'Waiting for the original destination device', with only a closing and restarting of Bvckup allowing it to note that the external HDD is now unlocked and available. Alternatively I'd have to go through Adjust back-up settings, then to the configuration for the destination device, and then reset the tracking method before Bvckup notices that the drive is available. @Rish10 - which version are you running? Hi Alex, thanks for this excellent software. It has replaced SyncBack Pro for me. Two of my backups run daily over a VPN that is connected at the start of the backup and disconnected at the end. Most of the time this runs fine, but once in a while although the VPN connects the destination cannot be found so after a timeout the job fails and it disconnects the VPN. However the job sits in "Waiting for the network device" state and doesn't attempt to run the following day unless I notice and force it. Could there be (or is there already) a timeout on the waiting status to reset the job to "Next scan in..." so that it reruns job and its VPN connection at the right time the following day? I have a Truecrypt drive that I want to back up. The source drive is always mounted. I have set up pre and post commands to mount the destination drive at the start of the backup, and to unmount it afterwards. If I right click the backup item, choose command, then run, all goes as expected. However, if I schedule it, I get the "waiting for destination device" advice under the item, and when the scheduled time arrives, it fails with the log entry "backup needs to run, but destination device is missing". Perhaps an option to "run (or start) even if source or destination is missing" would solve the problem. I include source because some users (for added security) might want to mount both source and destination drives before the backup, and unmount them afterwards. This is a fairly unusual situation - the option I'm suggesting could perhaps be available in the .ini file only. PS. This is the exact setup the original version of the program was created for and the reason for the existence of the delta copier. Any update on the central management system? I came here to ask if that was possible, and I think that would answer my request/question. My computer got hacked and infected with payday ransomware and encrypted all my files on my drobo pro. Bvckup 2 running on a separate server copied and replaced all the good backups on my second drobo pro 2. Also the archive are unusable. You guys should add antivirus ransomware extension list that get updated automatically and the program does not copy those files with those extensions. Is there any plan to provide a connector to Amazon Glacier/S3 or Azure blob storage? @roopsta - still on hold atm. @m3nyc - noted, but you should be able to recover the original from $Archive folder at the backup location. That's unless you switched off the archiving of deleted items. @FrancK - yes, there is, but no ETA yet. Would it be possible to add a "preview" mode, showing only the files that would be backed up but without actually doing the backup? I recently had reason to fear some file system corruption, and didn't want to overwrite my last good backup with an unknown number of changed-but-damaged files. A preview mode would have allowed me to quickly check for suspicious changes in the original files. It looks like my "preview" request is covered by the existing "Simulate..." command (right-click on the desired backup task, then click on "Command", then click on "Simulate..."). That looks good. Problem solved. I've just been bitten by the evil "MBR Error 1". Any way to have Bvckup allow drives' MBR to be saved and restored? Sorry to hear that and I feel your pain. Backing up the MBR requires descending below the file system level and reading/writing raw disk sectors. While not hard to do, it's just not related to what the program does at the moment (which is file backups), so it doesn't really belong in Bvckup 2. Another nice to have feature would be different recipients for successful and failed jobs (jobs with errors). In commercial environments failed jobs should trigger tickets whereas successful job run emails would be stored "elsewhere"
Counts the number of files that have changed or been deleted. On big jobs (> 3 TB, > 4 million files and folders) with lots of changes, there is a "big" delay in the log between the last "updating folder" log entry and the "Removing VSS snapshot" entry. I assume, that there are 2 things happening: 1.) writing the destination snapshot, so having a "Saving destination snapshot" entry (corresponding to "Loading dest. snapshot") would be nice. The 2nd thing is probably storing the log file (in that case it was 450 megs), so maybe a "saving log" entry would make sense as well. In my case bvckup was running for 20 mins, consuming a lot of CPU time before it finished it's job. we have several licenses of your product running in production and we are getting dependent on status of bvckup synchronization. We need to show the operator status of synchronization. We are interested in list of running jobs, progress, last status (ok/fail), etc. - i.e information from main window. I know only about one way to get similar info. That is command line actions after succesfull and unsuccesfull operation, but this is cumbersome for us for several reasons. This information is shared by "environment variables". If it is easy for you, just share this information in "environment variables" of bvckup.exe process. Of course Windows messages/TCP/UDP/file/etc. IPC would be great too. @Lubo - you can get job status via command line interface (https://bvckup2.com/support/forum/topic/411), however for capturing last run status you will need to use a post-backup script. If it is easy for you, just share this information in "environment variables" of bvckup.exe process. Sorry, I don't understand what you mean by this. Env. vars *are* set up when pre/post-backup scripts are spawned, so you can quite easily grab everything into a file with a simple "set > X:\Temp\last-run.txt" or similar. First: thanks for the excellent software! I'm loving it & raving about it to everyone (will be buying in a few days before trial expires). It would be nice (a luxury) to be able to directly select a single file (or multiple) to backup & be able to apply the timestamp wildcards to them. Currently I'm selecting the containing folder, then selecting the file, & backup up to timestamped folders. Furthermore, it would be nice to be able to backup to a folder within the source folder -- maybe a warning dialog instead of a denial, or a setting for this? I'm using the software to do version control for my design work, which usually involves just 2-3 files at a time. The first requested feature would speed up that process, & the latter feature would let me save timestamped versions to an "archive" folder within my project folder. I'm using Bvckup2 for general backups now, to external & to cloud, but it's also the best solution I've come up with for version control. Saving active project files directly to a cloud-sync folder is problematic; Bvckup2 serves as middleman & avoids locked files. I also see that keeping things simple can be good -- i.e. having as few settings as needed -- and I would be perfectly content with editing a config file to achieve these requests. it would be nice to be able to backup to a folder within the source folder -- maybe a warning dialog instead of a denial, or a setting for this? One really useful thing would be a possibility to silently install bvckup2. Preferrably with the an optional parameter to set service mode automatically (and install for all users). I'd like to suggest a "detect changes" option between "always use destination snapshot" and "Always rescan." In effect, "Use destination snapshots, but rescan after <n> days"
This would create a "mostly use destination snapshots" option that preserves much of the benefit, but with full scale validation every so often. I know that snapshot corruption is a low risk event, because I ran for a long time without issue. But when the issue occurred, there was no error detected to warn me that I wasn't getting all my changes. Thanks for any consideration and thank you for giving me so much peace of mind. whereby "5 days" can be an arbitrary count of minutes, hours, days or weeks. See https://bvckup2.com/support/forum/topic/1140 for how to add an override to a backup configuration.